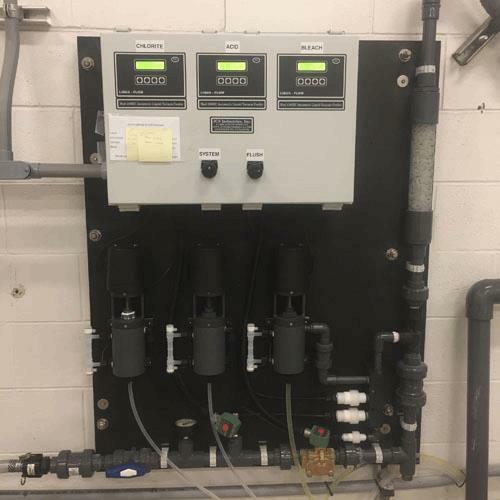 The water treatment plants (WTP’s) manager for the city of Midlothian, TX reports significant reduction in chemical costs, gaining new management control for their generation and feed equipment, and ending a pesky maintenance burden, by switching to three-precursor vacuum generator-feed, from batch-generator-pumping, for introducing chlorine dioxide (ClO2) into their 8 MGD plant #2. As a result, he plans to make the same change at their 12 MGD plant #1. 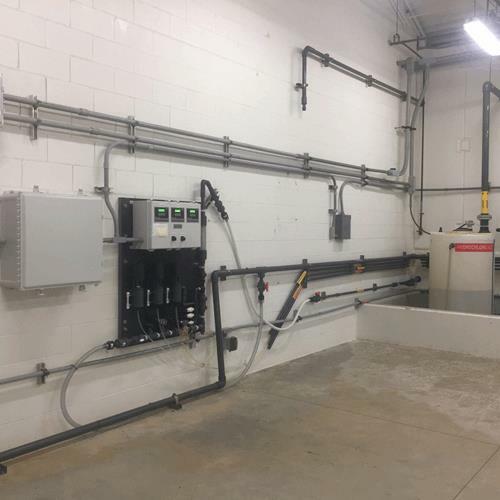 Switching to three-precursor vacuum generator-feed, from batch-generator-pumping, for introducing chlorine dioxide (ClO2), cut chemical costs, gained new management control for generation and feed equipment, and ended a pesky maintenance burden. The chlorine dioxide generator-feeder was manufactured by JCS Industries of Spring, TX. It features three-precursor vacuum injection that safely and simultaneously introduces sodium chlorite, hydrochloric acid, and sodium hypochlorite to generate a chlorine dioxide solution. The chlorine dioxide is introduced into gravity-fed raw lake water, primarily as pretreatment to oxidize out a geosmin-related taste and odor problem. The pretreated raw water then proceeds to sedimentation basins, where aluminum chlorhydrate (ACH) is introduced as a coagulant, and the output is pumped into membrane racks. Leaving the membranes, it is disinfected with free chlorine in the form of on-site generated bleach before entering the clearwell, where liquid ammonium sulfate (LAS) is added to make chloramines. Caustic is then injected for pH adjustment as a final step before distribution of finished water. He added that the #2 plant, which went online in 2012, had originally been provided with an ultraviolet (UV) system to help with the geosmin problem. But the UV use had soon been abandoned, in favor of higher ClO2 doses than an original 0.8 mg/L. When the UV was judged to be causing false chlorite readings, that required extra lab equipment and a certified operator to separate false readings from true, while also contributing significantly to an “electric bill that was off the chart,” it was taken out of service. Unique design of replacement system allows for continuous adjustment of 3 chemicals, based off the actual chlorite feed rate, to ensure accurate feed throughout the operator’s desired range. Internal electronics allow for the feed system to be remotely monitored and controlled through SCADA. The JCS chlorine dioxide generator-feeder uses three reversing servo motors, coupled with a v-notch valve to regulate the chemical feed rate, with electric flow sensors measuring 25% sodium chlorite, hydrochloric acid, and 0.8% sodium hypochlorite (bleach) to generate a >95% chlorine dioxide solution. The unique design allows for a continuous adjustment of all three of the chemicals, based off the actual chlorite feed rate, to ensure accurate feed throughout the operator’s desired range. Internal electronics allow for the feed system to be remotely monitored and controlled through SCADA. For further information, contact JCS Industries, Inc., 281-353-2100, sales@jcsindustries.us.com, www.jcsindustries.us.com, 5055 FM 2920 Rd., Spring, TX 77388. *Cliff Lebowitz is an independent reporter and editor. His third-party case histories are based on interviews with end users and their engineering firms, and are approved by them for accuracy and completeness. He holds a B.S. in Biology from Rutgers University.